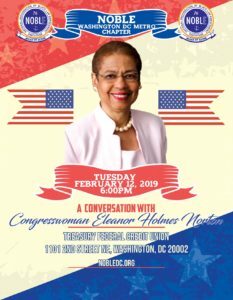 Join the Washington DC Metropolitan Chapter of the National Organization of Black Law Enforcement Executives (NOBLE) for A Conversation with Congresswoman Eleanor Holmes Norton (D-DC). Seating is limited, so please register in advance. CHAPTER MEMBERS MUST ALSO REGISTER. NOBLE may take photos and videos at this event. By registering, you consent to our free use of event photos/videos you may appear in unless you notify our Chapter President otherwise via email (Contact Us).